Chief Judge Christopher Conner of the United States District Court for the Middle District of Pennsylvania ruled that Raymond Holloway's second misdemeanor DUI conviction in 2005 was not a serious enough crime to result in a lifetime abridgment of one of his constitutional rights. Connor applied the standard set in the landmark case Binderup v. the U.S. Attorney General where the Third Circuit Court of Appeals found those convicted of certain nonviolent offenses can't be barred from owning firearms for the rest of their lives. He said the government had failed to show that Holloway's misdemeanor DUI convictions meant he should be disarmed for life. "Defendants' evidence fails to account for key characteristics of Holloway and similarly situated persons. They have presented no evidence indicating that individuals like Holloway—after over a decade of virtuous, noncriminal behavior—'remain [so] potentially irresponsible' that they should be prohibited from owning a firearm," Conner wrote in his ruling. "The government has not demonstrated a substantial fit between Holloway's continued disarmament and the important government interest of preventing armed mayhem." Though Holloway had only committed misdemeanors and only served 90 days of work release for his second offense, he was still considered a prohibited person and barred from firearms possession under federal law because his second conviction carried a possible sentence of up to five years in prison. 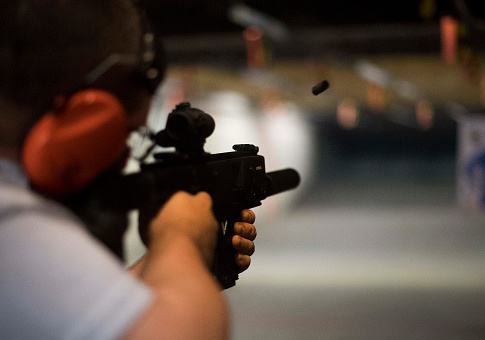 Federal law says that those convicted of a misdemeanor with a potential prison sentence of more than two years are prohibited from possessing firearms—even if they aren't sentenced to that amount of time in prison. When Holloway went to purchase a firearm in 2016, 10 years after serving his sentence, he was informed that he was barred from doing so. He then filed suit claiming the prohibition was unconstitutional as applied to him because his crimes were not serious enough to justify a lifetime ban. Judge Conner agreed with his argument. "We are happy with the court's decision, which found that an individual convicted of a second DUI was not a ‘serious' offense for the purposes of denying that person the right to keep and bear arms in perpetuity," Adam Kraut, one of Holloway's lawyers, told the Washington Free Beacon. "While most people understand that a felony results in the inability to possess firearms and ammunition, many do not know that a state law misdemeanor punishable by more than two years imprisonment has the same effect. It is comforting to know that the courts are open to restoring the rights of certain citizens who have lost their rights due to the general prohibition found in federal law." The case does not have an immediate effect on anybody other than Holloway—who will see his gun rights restored. It is, however, an indication of how lower courts will handle the precedent set in Binderup. The precedent is only currently only reserved for the Third Circuit, which encompasses Pennsylvania, New Jersey, Delaware, and the Virgin Islands. An attempt to get the Supreme Court to hear the case was denied last summer but there is hope within the gun rights community that a similar case could eventually make its way to the court. Kraut said his law firm would continue to pursue cases on behalf of clients like Holloway in an effort to secure their rights through the court system since, he said, the program intended to accomplish the same goal at the Bureau of Alcohol, Tobacco, Firearms, and Explosives is perpetually unfunded. "We hope to continue to be able to bring successful as-applied challenges for other plaintiffs, especially in light of the fact that ATF cannot grant federal firearms relief, since Congress has denied the agency the use of funds appropriated to it in order to conduct those grants," Kraut told the Free Beacon.